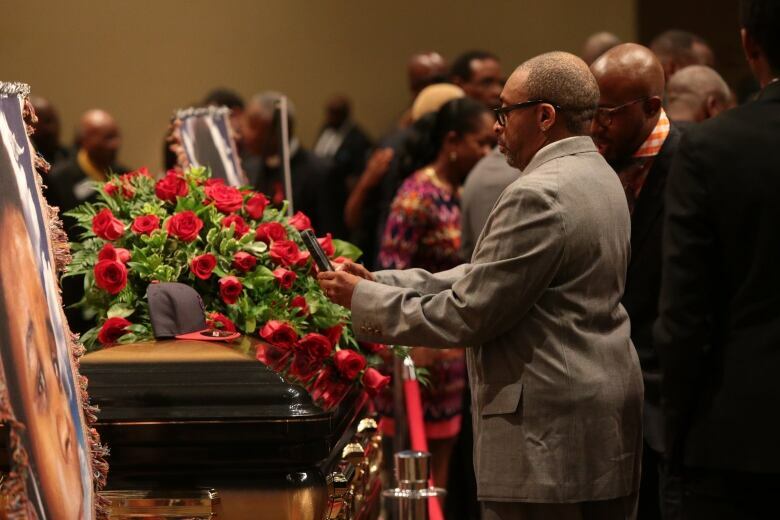 Mourners filled an enormous church to remember Michael Brown — a "gentle giant," aspiring rapper and recent high school graduate on his way to a technical college. But the emotional funeral was about more than the black 18-year-old shot to death by a white police officer. 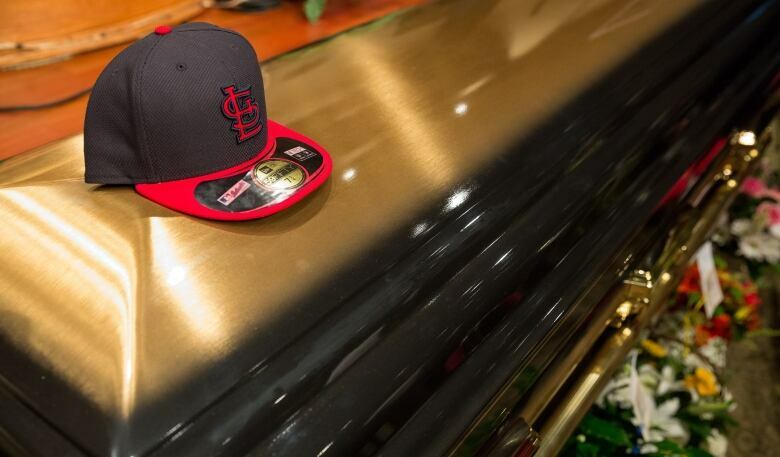 The mourners filled an enormous church to remember Michael Brown — a "gentle giant," aspiring rapper and recent high school graduate on his way to a technical college. But the funeral that unfolded Monday was about much more than the black 18-year-old who lay in the closed casket after being shot to death by a white police officer. The emotional service sought to consecrate Brown's death as another in the long history of the civil rights movement and implored black Americans to change their protest chants into legislation and law. "Show up at the voting booths. Let your voices be heard, and let everyone know that we have had enough of all of this," said Eric Davis, one of Brown's cousins. Civil rights leader Rev. Al Sharpton called for a movement to clean up police forces and the communities they serve. "We're not anti-police. We respect police. But those police that are wrong need to be dealt with just like those in our community that are wrong need to be dealt with," Sharpton said. "He did not know he was offering up a divine prophecy," Bernard Ewing said. In a stirring funeral oration, Sharpton challenged the audience to change the factors that led to Brown's shooting, including the heavy arming of police forces while their training fails to prevent a boy lying for hours "bleeding out" in the street. "Some of us are so heavenly bound that we're no earthly good …. But all of us are required to respond to this," he said, pointing to Michael Brown's casket, "and all of us must solve this." The crowd included the parents of Trayvon Martin, the unarmed 17-year-old African-American fatally shot by a neighbourhood watch volunteer in Florida, along with a cousin of Emmitt Till, a 14-year-old murdered by several white men while visiting Mississippi in 1955. Till's killing galvanized the civil rights movement. "We are required to leave here today and change things," Sharpton said. "Michael Brown must be remembered for more than disturbances. He must be remembered for this is when they started changing what was going on. … This is one of those moments …. "No community in America would tolerate an 18-year-old boy laying in the street 4½ hours, and we're not going to tolerate it either." The Rev. Charles Ewing, the uncle who delivered the eulogy, said Brown "prophetically spoke his demise." And now his blood is "crying from the ground. Crying for vengeance. Crying for justice." Sharpton also took the black community to task, saying it should be as upset about black-on-black crime as it is about police violence: "We have to be outraged by our disrespect for each other." "Blackness," he added, "has never been about being a gangster or a thug." Money and possessions prestige mean little, he said, "if we can't protect a child walking down the street in Ferguson and protect him and bring justice." Brown's death fueled nearly two weeks of street protests in the St. Louis suburb of Ferguson. But his father, Michael Brown Sr., asked protesters to observe a "day of silence" Monday to let the family grieve. The request appeared to be honored. At the Ferguson Police Department, where a small but steady group of protesters have stood vigil for two weeks, a handmade sign announced a "break for funeral." On Monday afternoon, the West Florissant Avenue commercial corridor was also devoid of protesters, whose ranks have typically swelled as days turned to nights. After the service, Corey Thomas, a 34-year-old St. Louis man said the large crowd at the church reflected "that people are tired of being treated like dogs. They're tired of being taken advantage of." The mourners came to show their support because "it could be any one of us," Thomas said. Angela Pierre, a machine operator who once lived in Ferguson, said she hopes the funeral helps turn a page and eases tensions. Most important, though, she hopes it provides healing for Brown's family. "I really wanted to just be here today to pray for the family and pray for peace," said Pierre, 48, who is black. "When all of this dies down, there's still a mother, father and a family who's lost someone. Sometimes a lot of the unrest takes away from that." Family and friends say Brown was an aspiring rapper with a gentle, joking manner who dubbed himself "Big Mike." He was good at fixing things, liked computer games, the rapper Lil Wayne, Drake, the movie Grown Ups 2, and the TV show Family Guy. "We're ready to move forward," said Marcus Baker, a junior at McCluer South-Berkeley High School. "But we're still going to remember him."